Dia de Los Muertos by Endorphina is an attractive slot with a Free Games and Gamble feature. This Mexican-themed game gives you a chance to win 5,000 coins. Dia de Los Muertos or the Day of the Dead is a colorful Mexican holiday that celebrates and remembers loved ones who have passed away. As part of the tradition, locals would prepare offerings like food, beverages, and gifts to the deceased. Endorphina joins in on the festivities by making its own game inspired by the Day of the Dead. The Dia de Los Muertos slot features traditional objects that are associated with the Mexican holiday. It even has bonuses that can let you bag big wins. Find out more about this slot in this in-depth review. When you load up this game, you will hear mariachi music that goes hand in hand with the slot’s Mexican theme. You will also see that the game is set on a wall with flower prints. The reels are on a red board that holds different symbols including the Lady of the Dead Catrina, a Mariachi, and pairs of skulls in different colors. The skulls are in Yellow, Red, Purple, and Green. Whenever you land a winning combo using the skulls, they shake their heads. Meanwhile, when you unlock a Scatter, a sunset scene plays which is the best animation that this game has. Aside from these, there are not many animations to commend. 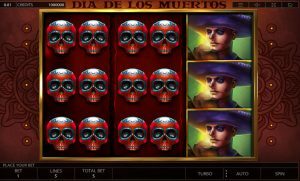 Dia de Los Muertos is a 3×3-grid slot with five paylines running across it. The slot also has a return-to-player ratio of 96%, like most Endorphina games. Before you start playing, you have to adjust your coin size and bet size. On the upper left corner of the slot, there is a Credits bar wherein you can adjust your coin size from 0.01 to 1. Meanwhile, on the lower left corner, the Bet button will help you choose the amount of your total bet from 0.01 to 50 coins per spin. For a hands-free betting session, you can use the game’s Auto feature in which the reels can spin automatically up to 999 times. You can also set the reels to spin faster with the Turbo option. You will find that Dia de Los Muertos has features like free games and a Gamble option. These bonuses can give you higher chances of winning huge rewards. Check these special features out below. This feature is triggered by having three or more Scatters anywhere on the reels. 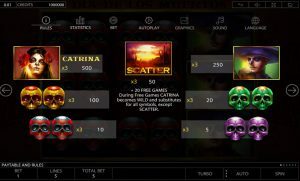 The Scatter is presented as a Mexican Landscape and will grant you 20 free games when unlocked. During the Free Games, the Catrina symbol turns into a Wild symbol. It will substitute for all symbols except the Scatters. You can retrigger the Free Games during this feature. 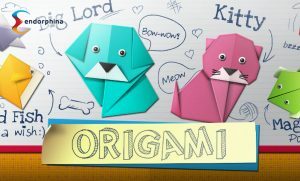 During this feature, the game will present you with one face-up card and four face-down cards. You need to choose one from the face-down cards. The goal is to have the chosen card higher than the face-up card in order to win. If the card you chose is of lower value, you lose. If the cards are the same, you will repeat the round. You can collect your winnings after each round you win. Other than the aforementioned bonuses, the maximum payout of this game is 5,000 coins. 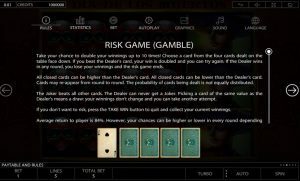 You can also try the Gamble option to multiply your payout up to 10 times. Should You Play Dia de Los Muertos? Endorphina made an attractive slot out of Dia de Los Muertos. It stands out among other Day of the Dead-themed slots like Esqueleto Mariachi, Oh! Catrina, and Fiesta De La Memoria. With its rewarding Free Games and Gamble feature, you can play this slot for hours. The slot’s gameplay is fairly simple. However, its betting range can cater more if you are a newbie player with its low maximum bet. If you are a high roller, then you should look through other slot reviews as this may not be the game for you. On the other hand, if you are a beginner, this Endorphina title is a must-try.